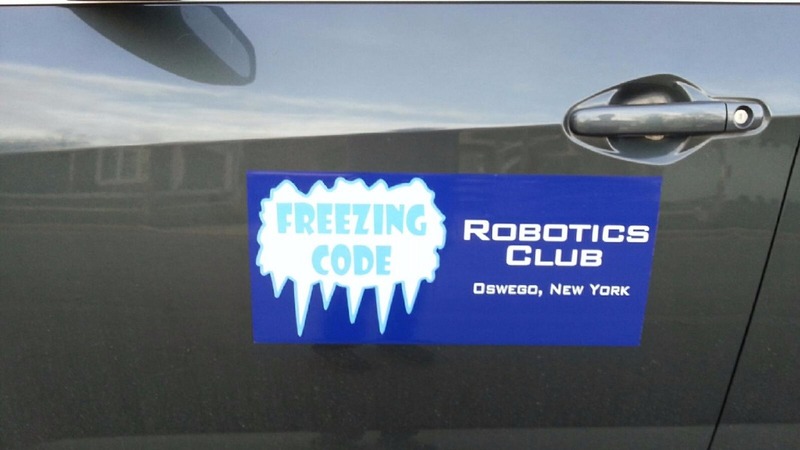 Freezing Code Robotics Club is a robot club of eight local youth (from grades 8-12) from Oswego, NY which is in its third year of building and programming robots. The club formed two teams this year and competed in VEX Robotics "Nothing But Net" tournaments all over northern New York State. Freezing Code has met several times a week since April 2015 to build their "Nothing But Net" robots and to create autonomous programs. This club met on snow days and over vacation time to improve the robots and their scoring potential. Over Winter Break alone, the club clocked over 50 hours rebuilding and recrafting the entire bot to overcome hurdles that were experienced during competition. The dedication and hard work of the students and the coaches payed off! They competed in more than 200 matches between November and March and earned many judged awards and tournament wins! Throughout the 9 tournaments attended, they received the Design Award two times, secured the Autonomous Programming Skills Award five times, received the Excellence Award four times, and became Tournament Champs all 9 times! This is an amazing record for such a new team. 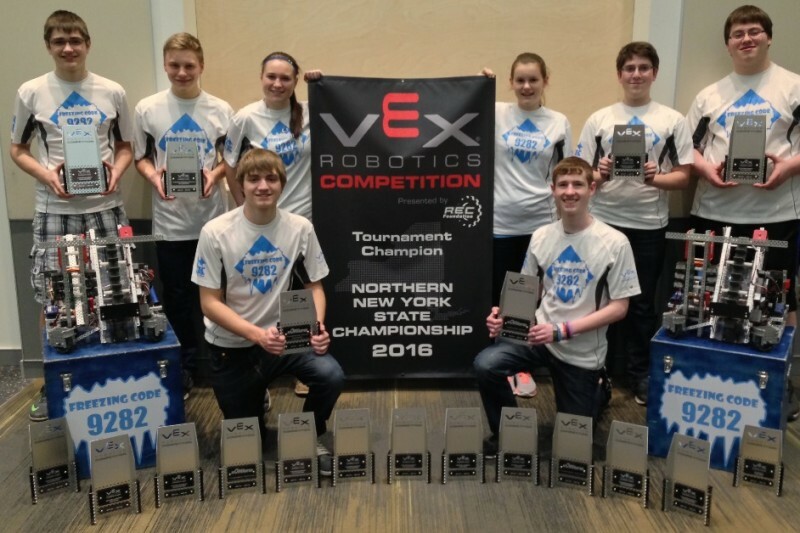 Freezing Code went on to win the 2016 Northern NY VEX Nothing But Net State Championship by being undefeated in all matches played that day and now qualifies for the World Championship Competition! Freezing Code, after successfully navigating the challenging and competitive 2015-16 season, now has the opportunity to compete against VEX robotics teams from all around the world. The competition season culminates this April 20-23 when the top performing teams from VEX Robotics Competitions around the world will compete against each other at the VEX Robotics World Championship at the Kentucky Exposition Center in Louisville, Kentucky. At the World Championship, these exemplary teams will have the opportunity to challenge their top-ranked peers from the United States and other countries such as Brazil, Canada, China, Colombia, India, Japan, Malaysia, Mexico, New Zealand, Puerto Rico, Saudi Arabia, Singapore, Spain, and the United Kingdom. The Freezing Code Robotics Club does not have funding from any large sponsors, but it needs to raise money to attend the World Championship. They have 4 short weeks to raise about $9,000 to cover travel expenses for the team. They are working very hard in their local community to raise most of the needed funds. They have several fund raising activities planned that they hope will raise approximately two-thirds of the total they need. We rely on the support from community members, family, and friends and with the help of gofundme, we are reaching out to the internet community to make our way to the World Competition! The members of the team are Matthew B, Michael B, Jeremy B, Adam H, Jordan R, Jordan T, Katrina U, and Lydia T. The coaching and mentoring is provided by Daniel Tryon, Mark Humphrey, and Casmir Usiatynski. They need your help to get to the next level of competition and to represent the city of Oswego, NY. Please help the Freezing Code Robotics Team travel the 682 miles to Louisville, KY this April! They have worked extremely hard to have this opportunity and look forward to the challenges ahead. Freezing Code continues to prepare for the World Championship! Robot improvements continue. In the game "Nothing But Net", a robot that can lift up it's alliance partner robot at the end of a match will receive a nice 50 point bonus! Freezing Code is working to add lifting capability to their robot. The fundraising also continues. The team continues to collect returnable cans and bottles. We also had a successful fundraiser at Canale's restaurant. Nick Canale presented the team with a check for $349! 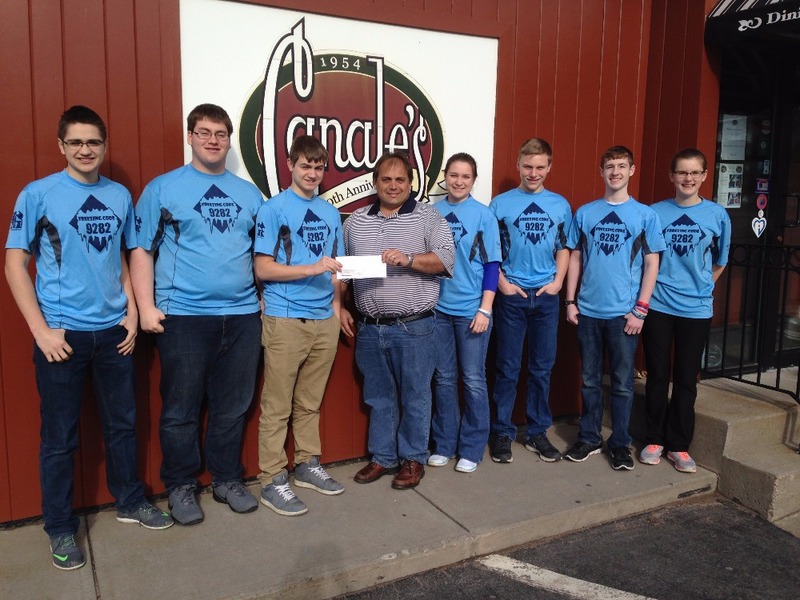 A big thank you to Canale's for great Italian cuisine and for your support!! Canale's restaurant supports the team! Wow! What a busy day for the team yesterday! Local fundraising is a lot of work but it also lets the team meet a lot of people and explain the importance of robotics. Part of the team spent the day running the concession stand at a local event. Selling hot dogs, cookies, chili, tacos, soda, pizza, and lots of other items raised some money for the trip to Louisville. THANK YOU to our local supporters who baked cookies, and donated a lot of the food for the event! 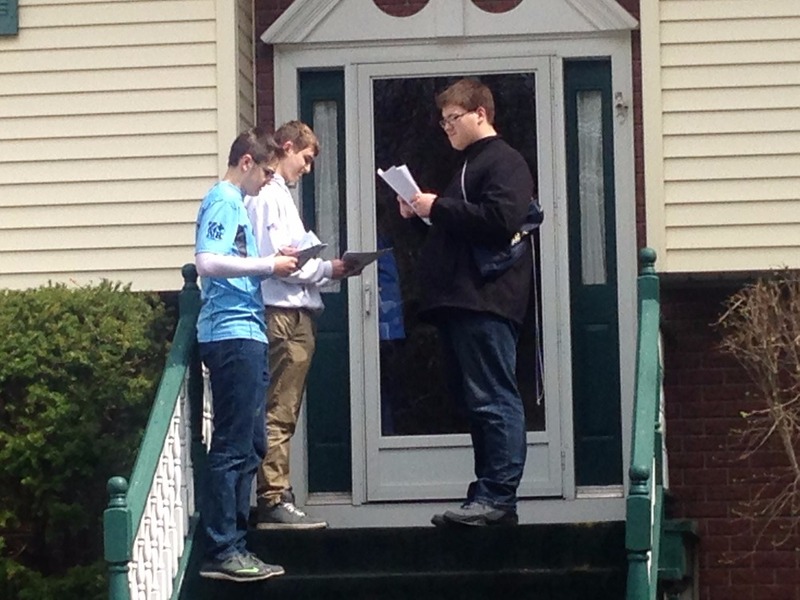 The rest of the team went door-to-door collecting cans & bottles, selling pizzas, and letting everyone know about the VEX World Championships! We don't know the total count of all the returnable cans and bottles yet but Oswegonians gave us a lot of them!! Thank you to everyone that contributed yesterday! The team was spread out around Oswego for the whole day, but we got back together for a nice team meal! Yesterday was busy but our weekend is not over. We will spend about 6 hours this afternoon working on the robot and getting ready for a presentation to the local board of education. Great effort this weekend Freezing Code! Thank You to everyone that is supporting the efforts of this group of hard working kids! Even our cars are sporting team colors! LOTS more cans & bottles collected! The Freezing Code team has been hard at work making their robot even better! The competition from around the world is going to be very tough and they are determined to be prepared! They have also been actively raising funds to cover the cost of the trip to the Kentucky Exposition Center for the World Championship. 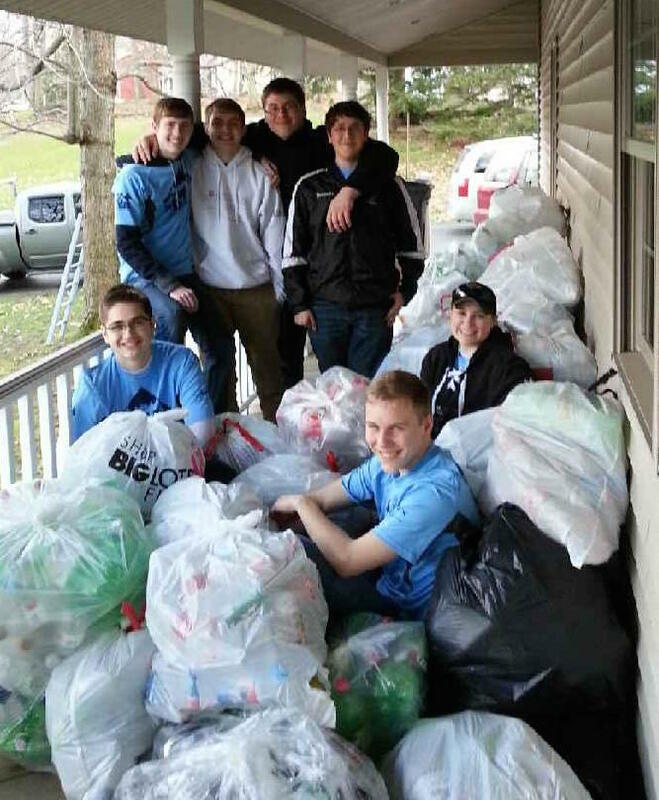 They have just finished a massive door-to-door can & bottle drive. 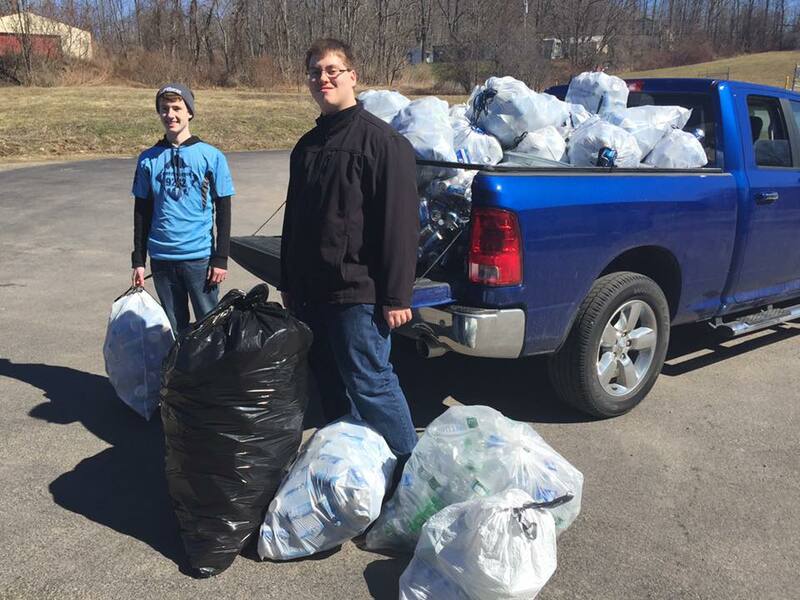 Thank you to everyone around Oswego that gave us your returnable cans & bottles. We collected more than 25,000 cans! Every nickel counts!!!! Thank you for your support! Just a few of the 25,000 cans collected! Best of luck at World 2017, we will be rooting for you! Best of luck kids. You girls and guys are awesome. Good luck to the team. You have done great to get this far and we hope you continue to do great.